About 1000 people staged a protest against order of banning headscarves in public places in Vienna. Protest march begun from center of Vienna and ended at square where foreign ministry is situated. Protesters were carry sign boards and chanting slogans denouncing proposed ban. Protest was organized by several Austrian Muslims associations and majority of protestors were women. 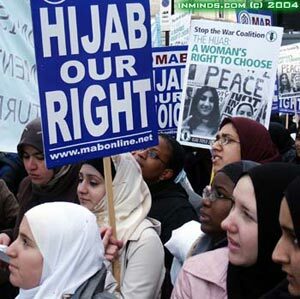 An organizer told media that, women should not be expelled from offices due to wearing Hijab or full face veil. Its discriminated order, they stand oppose to exclusion of Muslim from society. Its hereby informed that, Austrian Government made up of coalition of social democratic and Austrian People’s Parties, released a document this week which says that ban will be made on wearing headscarves or full face veil in public spaces because Government want to show neutrality. This document also showed that civil servants also refrain themselves from wearing any kind of religious symbols on duties and perform their duties impartially. Although, this document intends to have approval from parliament in order of being implemented in Austria. After its approval, this new rule will prevail in Austria for next 18 months or prior to the end of current legislative session. Whereas 600,000 Muslims dwell in Austria, with people of Turkish origin making up the largest community.